Little crocheted animals that support disadvantaged women in Vietnam. Made in the Japanese Amigurumi style, these Koji toys are a great gift for any child, and an even greater gift to empower vulnerable women. Giraffe crochet toy called Kirin. Buying this product = 12 Reward points for Members. Your cart will total 12 points = voucher of $0.60. Not a Member? Join at checkout to claim these points. 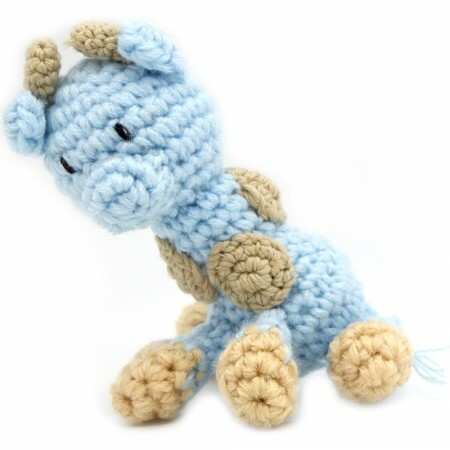 Each Koji Crochet Toy is handmade in Vietnam by disadvantaged and disabled women. Empowers women in fair-trade employment, helping them to become financially independent. Crocheted in Amigurumi style, a Japanese method that means "crocheted stuffed doll." Each toy animal has a song and story, which can be accessed at the Lichee Toys website. 10cm (L) X 8cm (W). Knitted with cotton-acrylic blend (80/20) and polyester fibre stuffing. Tested for toy safety. Browse our other educational toys and books. Handmade beautifully. Great idea supporting disadvantaged women.